Yesterday, the CDC officially announced that it “recommends that laboratory tests cleared or approved by FDA be used to aid in the routine diagnosis of Lyme disease.” This is a shame. Waiting for FDA approval suppresses innovation in Lyme testing and furthers the interests of those who have vested interests in the current flawed lab tests which miss as many cases as they detect. Neither of these is good for patients. This does not help patients. It does not protect patients. It protects vested commercial interests who currently market test that are highly insensitive. It also undermines any incentive they might have to improve their testing by protecting them from competition. Is FDA approval required for diagnostic tests? No, FDA approval is only required for tests that are marketed to other labs. Single lab tests, like those offered by IGeneX and Advanced Laboratory Services (ALS) do not require FDA approval. Instead, federal law requires that they undergo a rigorous validation process established by the Centers for Medicare and Medicaid Services (CMS) and Clinical Laboratory Improvement Amendments (CLIA). CMS and CLIA require developers to prove that their tests are accurate, precise, sensitive, and specific prior to marketing. Both IGeneX and ALS diagnostic tests are CLIA and CMS approved. Why is the CDC asking for more than compliance with federal regulations? And, how do tests the CDC is targeting fare? The IGeneX test is called on in a CDC “warning” issued in February 2005 cautioning against tests that “interpret Western blots using criteria that have not been validated and published in peer-reviewed scientific literature.” IGeneX test reports specify whether the test results meet the CDC interpretation criteria, which requires 5 of 10 IgG bands. However, other studies were able to increase the sensitivity of the test to 93% or higher by using an interpretation requiring 2 of 5 bands. So, IGeneX also reports this information. Why is the CDC ignoring these studies which have a far greater sensitivity? What about the ALS culture test? The CDC surveillance criteria list “culture test” as an acceptable test, and culture tests are widely regarded as the “gold standard” of testing. As noted above, the ALS test has been validated using the CLIA and CMS requirements. However, it is a relatively new test. A recently published study of the test demonstrated that it had sufficient sensitivity and specificity, but these findings should be confirmed in additional studies. Why not let patients–those who are affected by Lyme disease–determine whether they want to use this test pending further studies? Patients want diagnostic tests with greater sensitivity so that patients can get diagnosed and treated. A recent article pegs the number of Lyme tests performed annually at 3.4 million—which translates into a market of roughly $340 million a year. The CDC recently revised its case numbers from 30,000 to 300,000. These numbers tell us that there is a lot more Lyme around that is not captured by the surveillance system, which relies heavily on flawed FDA approved tests. They also tell us that commercially vested interests and the researchers they consult with may have a stake in keeping the status quo in lab testing regardless of how bad the tests are. This post is an update of a post originally published March 16, 2013 on LymePolicyWonk. 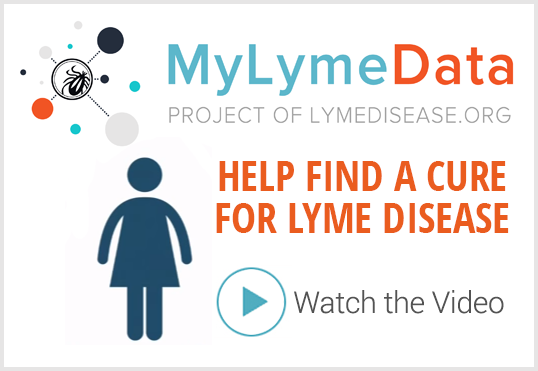 Centers for Disease Control, Concerns Regarding a New Culture Method for Borrelia burgdorferi Not Approved for the Diagnosis of Lyme Disease, MMWR April 18, 2014. 63(15); 333-333. The American Association for Clinical Chemistry, which is a professional association of over 8,000 members concerned with blood diagnostic tests, has an extensive website describing diagnostic lab test validation requirements. Interested readers should check it out. Centers for Disease Control and Prevention. Notice to Readers: Caution Regarding Testing for Lyme Disease. Mmwr. February 11, 2005 February 11, 2005;54((05)):125. Engstrom SM, Shoop E, Johnson RC. 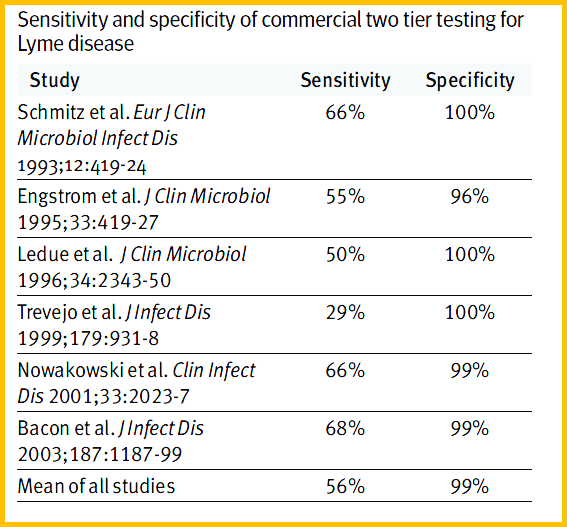 Immunoblot interpretation criteria for serodiagnosis of early Lyme disease. J. Clin. Microbiol. 33(2), 419–427 (1995). Kelly, J. Lyme Culture Test Causes Uproar. Medscape (Jan 30, 2013). Ma B, Christen B, Leung D, Vigo-Pelfrey C. Serodiagnosis of Lyme borreliosis by western immunoblot: reactivity of various significant antibodies against Borrelia burgdorferi. J. Clin. Microbiol. 30(2), 370–376 (1992). Sapi E, Pabbati N, Datar A, Davies EM, Rattelle A, Kuo BA. Improved culture conditions for the growth and detection of borrelia from human serum. Int J Med Sci. 2013;10(4):362-76. Shah JS, Du Cruz I, Narciso W, Lo W, Harris NS. Improved clinical sensitivity for detection of antibodies to Borrelia burgdorferi by Western blots prepared from a mixture of two strains of B. burgdorferi, 297 and B31, and interpreted by in-house criteria. European Infect. Dis. 2010;4:56–60. The lack of accurate lyme testing continues to be both infuriating and very disheartening and discouraging. Until the financial conflicts of interest end, I don’t see anything changing in my lifetime. So very frustrating. Thank you for this EXCELLENT piece! The graphic w/comparison is better than anything I have seen to get down to brass tacks…. Sharing Sharing Sharing! Great piece! Who regulates the CDC, is it congress or the executive branch? I think we should write letters or complain to someone about this double standard. The Office of Inspector General of the DHHS or the Government Accounting Office. The Office of Inspector General has been doing some good work as of late but the GAO is probably the most independent organization in the Federal Government and answers only to Congress. The OIG head is a political appointee and also answers to Congress. I encourage you to write to both organizations. Lyme activists got a GAO team to investigate about ten years ago. They did not do a very good job and I am not sure another report would be any use. It seems all to depend on who is assigned to do such investigations, and how subservient they are to people with more medical credentials than they have. In short, I think it is too easy to hoodwink the GAO. Thinking about this more. It does seem like it is time to go on the offense, instead of always being on the defense. Barbara Johnson is a patent holder for an ELISA test, while being a government employee. Why they changed the rules so that people at CDC and NIH can profit monetarily from their work, can patent things discovered during their civil service job. This was a terrible idea because it allows a built in conflict of interest. Probably not going to get this repealed, but when individual cases become egregious, it is time to go public with a complaint. Even if her patent is not currently being used in a test, it is still a reason to defend ELISA testing, and to continue insisting the two tier test is the only one that can be used. Despite the fact that testing is not under the purview of CDC. Despite the fact that their two tier test isn’t much good and the consequences of its failures can be very bad, not to mention sometimes fatal when patients do not get treatment. So, why should this information not go to a friendly senator or congressperson as a complaint about the CDC? If the legislator then contacts the head of the CDC or maybe the head of the agency it is under (however Sibelius is retirng), so maybe head of CDC is the way to go. Congressional inquiries get attention from government offices, unlike private citizens who can more easily be brushed off. Maybe hold off until some of the validation studies, publication of articles rebutting Johnson’s attack on Advanced Lab? The reason this is important to do is because that latest Johnson piece in MMWR has brought in the FDA, and it is only a short step from there to having the FDA shut down that lab. Don’t look for honesty; other labs have been shut down for no legitimate reason. Or they could tell the lab to stop doing the culture. Bad things can happen. GO ON THE OFFENSIVE! It’s all about money and power. I like to call the CDC the Center for Disease Cover-up and the FDA the Fatal Drug Approvers. Proteomics was very promising for the detection of any disease. The first one was Ovacheck and being high risk for ovarian cancer I entered the study back in 2002. In 2007 I wondered what happened to the test so I started researching and found Congressional testimony that doctors at the NIH left to start a new company that competed with the patent holder of Ovacheck and a few other diagnostic tests they had developed. The company eventually went out of business because they couldn’t get their test approved (the FDA said it was going to regulate it as a medical device) which is unfortunate because ovarian cancer is usually found when it is too late. In conclusion it isn’t Lyme disease although the Lyme community has done an amazing job in bring about awareness of the conflicts but it is our medical industrial complex that is the problem or cancer industrial complex or fill in the blank. And the patient population pays dearly for their corrupt and greedy behavior. You’re right we all need to be more involved. Also read “Next” by Michael Lewis. The way he describes new technology as having the ability to flatten the business hierarchy is fascinating without the permission or interference of the militant FDA, CDC or the NIH. This article would be much more helpful, especially for those new to the field, if it explained some of the tests mentioned: it does not define or give a link to information about the “C6” test or the ALS test. You are correct. I need to amend this to reflect your comment. I am at lost for words when it comes to the CDC. We are in an epidemic when it comes to Lyme Disease, as many cases get hidden due to the so called two- tiered testing. Elisa test was negitive, so years went by for my daughter with symptoms going to her heart, joint, body and now her brain. She will never be the same ever again. For the last 10 yrs since the age of 15, my daughter has suffered. Yes, a Wertern Blot was finally done years later and tested positive for Lyme but will the CDC take care of her now with her body and brain damaged?. Francine Roca, Tarpon Springs Fl. I am so sorry for your daughter. It is sad for sure. I don’t have Lyme disease and neither does anyone in my family but we are becoming quite active in fighting the corruption in medicine. This is the best place to start because that is what this is all about, corruption and greed. I think of the parents whose children are autistic because, many believe, of the mercury laced vaccinations. I can tell you I would be fit to be tied. How do these parents live with the knowledge that their child was injured by vaccinations and not a single doctor will support them? And then there is surgical mesh. Every single woman that has surgical mesh has 24/7 pain and infections for a product that never should have been used. But we hear nothing of these stories. Johnson and Johnson is responsible. Those in the Lyme community in my opinion have done the best job of organizing but we need to bring in more people and we need to understand it is all about corruption and greed. Francine, we are in the same boat here with our two girls. It is shameful how their young lives have been spent in illness, pain, and debility due in part to the CDC’s refusal to come to terms with the enormity of the Lyme epidemic. It’s also shameful how doctors expected them to accept their illnesses with no diagnosis other than psychosomatic disorder. No one suggested further testing, or even Lyme, for that matter. It was a never-ending quest for answers that finally led me to Igenex and their Western blot. I want to do more to stop this madness, but unfortunately most of my time is spent trying to get my girls well. That is the case with so many; they’re too sick to do little more than devote their time and energy to seeking answers to their enormous health issues. This has got to stop! Teresa, you are working under the assumption that the CDC, NIH, etc actually want to have cases diagnosed correctly. This is obviously not true, judging from their behavior for the last decade and more. How can the CDC continue to endorse the insensitive FDA-approved test kits, without admitting how problematic this is to those that really matter, the hundreds of thousands of patients who remain undiagnosed and untreated. In order to get CLIA approval, laboratories do need to meet standards for specificity and sensitivity. Since the FDA routinely approves two-tier test kits that demonstrate a sensitivity rate below 50%, I fail to see how the FDA approval process is such a huge improvement over the CLIA approval process. In my family’s case, gender inequality in response to treatment and testing has had devastating consequences for my daughter, who at the age of 12, continued to test negative for Lyme via FDA approved test kits for months after receiving an early but inadequate treatment (two weeks of amoxicillin) for suspected Lyme disease. Even as she developed more and more troubling symptoms, her physician continued to insist on the validity of the two-tier testing and would not give her further treatment. Her infection with multiple tick-borne illnesses was confirmed much later via direct testing (PCR, FISH assays, Giemsa staining), as well as via the IGeneX criteria for the IgG and IgM Western blot). I have never seen any response from the CDC to Dr Aucott’s research regarding gender inequality in diagnosis and treatment of Lyme disease. I am saddened that this lack of response will mean that thousands more young women like my daughter will suffer and have their dreams curtailed, while those with vested interests in the FDA-approved test kits are protected. Lorraine, could you post this as a comment on the Medscape article? It would get a lot more eyes there, and needs to be said. Ms. Johnson, are they implying to use only their stated tests for surveillance or for any sort of diagnosing of Lyme? And doesn’t Barbara have a COI if she holds a patent to the ELISA, a test she seems to be recommending? This article is so depressing. Nothing’s going to change is it ? We sufferers still can’t get the “test” that will back us up with insurance companies. I was infected at age 18 in 1974. Undiagnosed for 30 years. Fought for 10 years with every protocol and every scrap of money available. Insurance would cover nothing. I had about 4 “good years” and thought we had it licked. I am now 58, sicker than ever and bedridden. Why is it that all veterinarians across the lower 48 are knowledgable and treating lymes in animals (see… http://Www.capcvet.org) yet humans have to suffer ? Nothing’s going to happen in what remains of my life. What a shame. This is supposed to be the most highly developed country in the world. For those of you who suspect you have Lyme & can’t get a diagnosis or haven’t had success with anti-biotics : Are you aware that Colloidal Silver 2-3 x a day for 90 days will kill Lyme and secondary co-infections. You will have die off and need to detox from the herxing but it works because it is an anti-viral,anti-bacterial, and anti-fungal that passes thru the blood barrier where spirochetes hide inside cells. Antibiotics are not the answer. I would recommend taking good probiotics since the only side affect of long term use is a lowering of beneficial bacteria in the digestive tract. 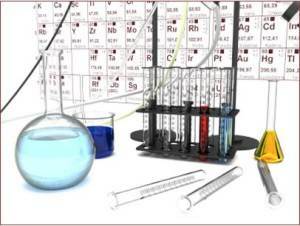 Check out the history of Colloidal Silver & why it worked too well to keep using , why antibiotics were patented & pushed, and how epidemics like Polio and Aids could have been avoided with colloidal silver because of its antiviral properties. Now that Lyme ( a disease that was created by our government for bio-warfare ) has been released it is time for us to take charge of our own lives and stop waiting for someone else to do the right thing. You don’t need to have a “proper diagnosis” to know that you have Lyme. It is affordable to buy a good machine that makes Colloidal Silver or buy it at your local health food store. It is also imperative to clean up your diet. Stay away from sugar, especially high fructose corn syrup, avoid processed foods, and eat as organic & healthy as you possibly can. The bottom line is that even the best medicine can only do so much and then our immune system needs to be strong enough to keep us healthy. The solution would seem to be highly sensitive and specific antigen tests. The first is supposed to come out in summer 2014. More antigens should be added in 2015. FDA approval will be 12-18 months after release to market.